Thomas Alexander Hunter, pioneer tertiary academic, educationalist, Freethinker, sportsman and worker for humanity. Thomas Alexander Hunter was born on 28 February 1876 in Croydon, Surrey, England, the son of Louisa Jane Harton, a woman of force and character, and her husband, William Hunter, a banker’s clerk. The third of five children, Thomas was influenced especially by his brother Irwin, seven years his senior and a formidable battler for what he saw as right. 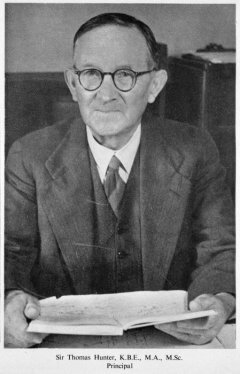 After teaching briefly at Waitaki Boys’ High School, Hunter was appointed in 1904, for one year only, as lecturer in mental science and political economy at Victoria College, Wellington. He rapidly gained ‘the respect of the hard-working, and the confidence of the muscular element’. He coached rugby as well as playing for the college XV, and sought help with his German from his colleague, George von Zedlitz, in order to read untranslated writers on psychology. Hunter quickly revealed his lifelong conviction that veracity is the heart of morality, and his readiness to say what he thought. Council, as well as the students, was impressed; his appointment was renewed. The future seemed secure and on 14 March 1905 he married Isabel Zella Pope at Dunedin. The new subject of experimental psychology caught his attention, and in 1906-7 he visited universities in Europe and the United States. He was decisively influenced by William Wundt at Leipzig, William Rivers at Cambridge, and especially by E. B. Titchener at Cornell; the main lines of his subsequent thinking about psychology were established. He was aware at all times of new ideas and trends, but an experimental approach to problems of perception and learning was to remain his major interest. Following his return to Wellington in 1907, Hunter gave a demonstration in his room of equipment brought back from Cornell, and persuaded the college’s council to provide an additional £50 to establish the first psychological laboratory in Australasia. Later, working with his colleague W. H. Gould, professor of education, he established a psychological clinic for problem children. At the end of 1907 he was made professor of mental science and economics, redefined in 1909 as mental and moral philosophy, a subject area which evolved into the two fields of psychology and philosophy. From his arrival at Victoria [University of Wellington], Hunter had an impact on almost all aspects of life in the small and intimate college. Possessing a vigorous practical mind, great powers of work, strong common sense and a profound belief in applying the intellect to social and educational issues, Hunter rapidly won a following and made an enemy or two as well. He worked with a number of able colleagues – Thomas Laby, George von Zedlitz, Harry Kirk and David Picken – in the New Zealand University Reform Association, formed in 1910. As its secretary he showed a capacity to manage a diverse group of allies. They sought to place more responsibility for the curriculum, for teaching and for examining in the hands of the academic staff rather than the remote Senate of the University of New Zealand – a body that never saw a student – or examiners in Britain. This was to be a long fight, and it was not until a royal commission sat and reported in 1925 that a somewhat more satisfactory system emerged. Hunter was made a KBE in 1939. In 1946, to mark his 70th birthday, his colleagues presented him with a volume of essays, The university & the community , the first time such a tribute had been paid in New Zealand. In 1950 the University of New Zealand conferred on him an honorary doctorate of literature. At the beginning of the following year he retired as principal and two years later, on 20 April 1953, he died. His wife had predeceased him on 16 February 1950; he was survived by two daughters and a son. Thomas Hunter was almost 75 when he retired and he had served Victoria University College for almost 50 years. He had his intellectual limitations: his interests clearly did not include the aesthetic or literary. But as a teacher, a reformer and an administrator his influence had been profound. His belief in education as a force for good matched a consuming and consistent hatred of ignorance. At the same time he had a fierce distrust of mere good intentions. He wanted his students to think for themselves, to stand on their own feet. If one result was that the college came to have a radical reputation, to be seen as a dangerous place for the more conservative or conventional to entrust their young, this could be seen as evidence his hopes were being realised. Described as ‘Free, independent, and courageous of thought, of great acuteness and fertility of mind, he was for very many people, both student and public’, the ‘very essence’ of his college. A portrait by Evelyn Page painted in 1949 captures the alert figure but does not fully convey Hunter’s humour, kindliness and questioning nature. The painting hangs in the original university building that now bears his name. © Crown Copyright 1996-2008. Published by the Ministry for Culture and Heritage, Wellington, New Zealand. All rights reserved. There are more direct walking paths and lifts from Lambton Quay to the Terrace, use them if you find them. Although Victoria University of Wellington looms large over Central Wellington City it is not easy to see from medium distances because of the steep hillside and proximity to high-rise buildings. However it is very accessible, although parking is difficult. Walking: Walk from the city using the instructions at right. About 20 minutes of steep walk. Or walk for 5 minutes fairly flat from the Cable Car alighting at Kelburn Park. The Cable Car begins in Lambton Quay in the central city. Or walk in from just about anywhere. The university is close to the Botanic Gardens and about 3kilometres from the green belt and if you have a few hours and directions you will enjoy the experience. Bus: Take a 17, 18, 22 or 23 bus all of which stop at the bottom and top entrances to the university. Driving: Tricky for parking but practical with a walk of about a kilometre from the suburb of Kelburn above the university.